communicating a solution to a problem with certain limitations such as time and lack of imagery. Separating 10 teams of two allowed for a “Writer” and “Doer” to attempt in the recreation of predetermined models; their efforts provided insight into the pros and cons of different methods of communication in approaching a problem. Ultimately, since the experiment and results were mostly qualitative, the experiment proved useful in revealing what workshops and skill sets should be further explored and expanded upon for the education of young engineers, such as ourselves. Many young and aspiring high school engineers had the opportunity to participate in their Science Olympiad challenges. A common exercise they would encounter was the infamous "Write It Do It." The exercise carried out as follows: You have teams of two who are split into the "writer" and the "doer." The writer observes a figure constructed of simple materials and is given a limited amount of time to jot down his/her method of describing the witnessed diagram in an effort to communicate to his/her respective "doer" partner. Once their time is up, the "doer" then has a limited amount of time to interpret the "writer's" communication, utilize provided materials, and attempt to recreate the figure initially introduced to the "writer." The beauty of this experiment is that it both serves as a team building exercise to bring engineers closer together as well as allows engineers to personally view what elements of communication they can improve upon. At the initial hatching of our idea, it was unclear as to how we would quantify and find concrete results after carrying out our experiment with the students of the engineering class. However, when all was done and recorded, we realized that our experiment, while it requires some refinement, can go an incredibly long way in enhancing the writing skill sets of CCNY's future engineering students. Three original objects were constructed from a combination of the above materials and displayed before the “Writers.” There were no constraints for building these structures, but is noted that they were built within a reasonable timeline within 30 minutes. Upon approval of the three original objects, three stations were set up for display. One person from each of the ten teams were randomly selected and acted as the “writers.” They were set up around the three structures as follows: three people surrounded structure one, four people surrounded structure two, and three people surrounded structure three. The “writers” were instructed to describe their respective objects to the best of their abilities while only using written text. Their goal was to communicate, using only the written language, to their partners (the “Doers”), who would then have to utilize this written communication in order to reconstruct the objects originally displayed to the “writers.” In addition, there were a few constraints and specific bits of instruction that the writers had to abide by during this phase: 1) The subjects could not draw any pictures, use any pictures from the internet, or upload any pictures themselves. 2) The writers had to type everything on a Microsoft Word Document and number their paper according to their group number/structure number. 3) There was no limit on words allowed, but there was a twenty-five minute time limit. 4) The rest of the class was asked to wait outside. And finally, 5) When finished, the subjects were asked to email their work to one of the researchers. Once the writing portion was complete, the writers were then asked to leave the classroom and to leave their Word Documents open on computers. The original structures were hidden away from sight. The remaining ten team members, the “doers,” were asked to sit at their respective group numbers. They were told that they would have $10 worth of compensation for having the “best” build. The subjects were then asked to reconstruct the object using only what was provided to them in the respective Word Documents in front of them, left by their “writer” teammates. The subjects were given more materials than were needed to build the original structures and were allowed to ask for more material at will. The time limit for the “doer’s” construction of the original objects was 35 minutes. Upon completion, the “doers” were asked to leave the room, and pictures of the “doer” structures were taken. The written work was analyzed for non-subjective recurrences, and these recurrences were correlated with the consequential structures. The data that was ultimately collected was deemed completely qualitative. “doer” to use all the provided materials. This ultimately resulted in a failure to reconstruct the original objects. Next, we noticed that group 1’s description didn’t flow in chronological order (i.e. they didn’t start from the bottom or start from the top) and made no reference to an initial starting point; their instructions were all over the place. In contrast, groups 2 and 3, which also looked at structure 1, both made it clear that the doer was to start from the bottom and gave chronological instructions, working up to the top. What is particularly interesting to note is that groups 2 and 3, who both used chronological instruction, performed worse than group 1. This is probably due to the fact that the doers were not attentive to the directions written. We think that when applied to an engineering task, the technical writing should definitely start with a list of materials, as group 1 successfully did, but also should be in combination with a chronological order, as groups 2 and 3 used. Group 3 used analogies in their technical instruction, which did not work well for them. Analogies are tricky when it comes to technical writing because, unless these analogies are very well known, sometimes the reader will misinterpret them, as they did in Group 3. In the written compositions of groups 4 to 7, who were exposed to object 2, there were also other beneficial creative characteristics between the writing styles of some of the groups. In both groups 4 and 7, describing the face-like top portion of the structure as being a “clock”, with the various features being placed at different “hours”, allowed the builder to gain a good sense of where the positions of the various thumbtacks and rubber bands were. The composers would refer to a certain material being located at “6 o’clock” in order to approximate its location on the plate. Furthermore, in every group’s composition (except for group 7), the description of the final product as being a face was greatly helpful in the structure’s construction, since it gave the builder an idea of what the structure should look like in the end. Interestingly, group 7, which didn’t mention a face in their composition, ended up being the most inaccurate with regards to the top portion of the structure, was completely off, and had no resemblance to being a face at all. This mention of a face was so important that even group 6, whose written composition was the shortest of the four and even lacked a finished description due to lack of time, did a better job of recreating an actual face because of this singular detail. 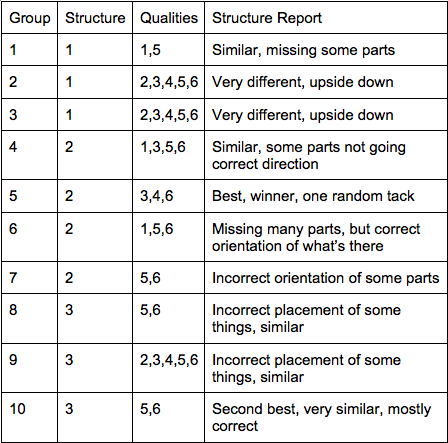 An interesting feature of the winning group (group 5) involves the use of a pure description of what the structure should look like instead of a step-by-step walkthrough on how to create it. This was different from the other groups, who relied on very technical instructions and even an itinerary of materials to guide their partners. In group 8, the writer developed the instructions in steps. There were, in total, eight steps. He first focused on the structure description with regards to the plates. After including initial skeletal steps, he then went on to more detail for clarifcation. The writer implemented rotational degrees for the builder to orient the rubber pieces. He mentioned the materials, colors, and position. In addition, the main steps were even enhanced with bold type in order to give the steps enhanced importance. Unfortunately, the description was not as accurate as it could have been - especially the distance among the popsicle sticks. The doer was not confused at first; he started by having the first building as the main structure. The sticks, however, were inserted into the wrong position. The balloon in the center was also deflated on purpose, but the rest of the details were almost right — including the rubber bands and thumbtacks. Although it is not angled properly, the details almost matched that of the original. In group 9, the writer also separated the instructions into steps. The first step regarded the base. He began from the base and provided instructions to build up to the top. An interesting and useful feature involved him mentioning the inclined angle to be 30 degrees. In addition, the “structure steps” were followed by “detail steps.” Further more, he mentioned the colors of each tack and rubber; unfortunately, the position was incorrectly stated. With respect to the doer, the structure was wrong again. The doer was confused with the structure due to the inclined angle. He built it up from base to the top. The details were almost accurate, but the plates were still not inclined. In addition, the popsicle sticks’ positions were also incorrect. The writer for group 10 used very simple steps in her description. She started from the cups at the bottom and built the structure towards the top. She also mentioned the angle between two plates. She wrote down the colors in order so it became convenient for the doer to follow. Everything else was put in order, and the instructions were very concise. The brief instructions weren’t confusing for the builder to read, and there was a “flow” to the instructions that allowed the doer to build the piece at a consistent pace. This set of instructions was the shortest and the most efficient. The doer directly and quickly followed the steps. The basic structure was completed in a short amount of time, and the details were added immediately after. Other than a small mistake regarding the rubber bands at the top, this build had the closest resemblance to the original structure. While we did not answer our original question of testing the effectiveness of writing for engineers, we were able to gather data on interesting trends, evaluate which of these trends were beneficial, and understand which were actually detrimental to the end result. We hope that our results have shed some light on the writing habits of freshman engineering students. It is important to keep in mind that the time constraint did not quite allow students to edit accordingly, but that the results still give a good idea of how students are thinking when they're writing this sort of description. In the future, this exercise can be recreated on larger scales, different variable control (such as time constraints and forms of communication), and serve as a tool towards developing a more efficient communications curricula for freshman engineering students.